Should I send Business Christmas Cards? Staying in the front of your customer’s mind is increasingly important to the success of your business as is letting your staff and supplier know how important they are to the ongoing success of your business. Christmas cards represent a very valuable tool in this endeavour. The tradition had continued to grow with the number of Christmas cards sent in the USA around 1.6 billion. Australians send around 70 million, that’s a lot of staying in touch! Seasonal cards are a great way to say thank you to your employees, customers and suppliers your business has worked with throughout the year. You can add other useful information like confirming your Christmas closing and reopening dates and who to contact over the shut down period. You can even take the opportunity to subtly advertise special offers that are available in the lead up to the break or in the New Year. Not convinced that it has any value? Science on the subject is a little thin however, the following goes some way to putting some rigour into the argument for the use of greeting cards. Businesses that are interested in deep lasting relationships should certainly be working hard to trigger that feeling of embeddedness and connection with their customers, staff and suppliers. Don’t let the opportunity slip by. There are businesses out there ready to help individuals and businesses get their best wishes out to their stakeholders. Including customised greeting cards, hand written greeting cards, on-line personalised Christmas cards and mailing list management services. It really isn’t that hard to switch on this valuable relationship building tool. Don’t get lost in the crowd. Ensure that your ‘Christmas cards’ stand out for repeat recognition. With 70 million cards adorning coffee tables, reception desks and office walls throughout Australia it is also important to stand out. Careful and tasteful placement of company logos and the use of corporate colours can assist in your message being seen multiple times as individuals move in and around the work place. You don’t want your message being lost helplessly in the sea of cards. 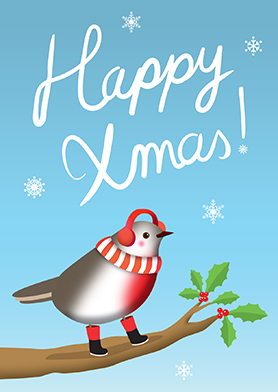 Let FuzzyCat Cards help make giving Christmas cards to all of your customers and suppliers easy. FuzzyCat on line greeting cards. This entry was posted on Friday, November 7th, 2014 at 12:20 pm	and tagged with Business Christmas cards, Christmas cards, corporate Christmas cards, corporate greeting cards, fuzzycat, fuzzycat greeting cards, greeting card, greeting cards, reasons to send a card, reasons to send a greeting card and posted in Greeting Cards. You can follow any responses to this entry through the RSS 2.0 feed.